Tucked away in a tranquil leafy corner of Great Elm, a small village near Frome in Somerset, is Jackdaws Music Education Trust. Now in its 25th year, Jackdaws was established by the singer Maureen Lehane in memory of her husband, the composer Peter Wishart, and took its name from his most-performed song, ‘The Jackdaw’. Their modest former home is host to a wide variety of very popular short music courses and workshops for adults and children, as well as concerts and opera performances. Courses take place throughout the year, usually run from Friday evening until teatime on Sunday. The courses are led by inspiring musicians and teachers, and bring together passionate musicians, from the humblest amateur to the aspiring professional, to learn and develop together in a homely, nurturing and friendly environment. 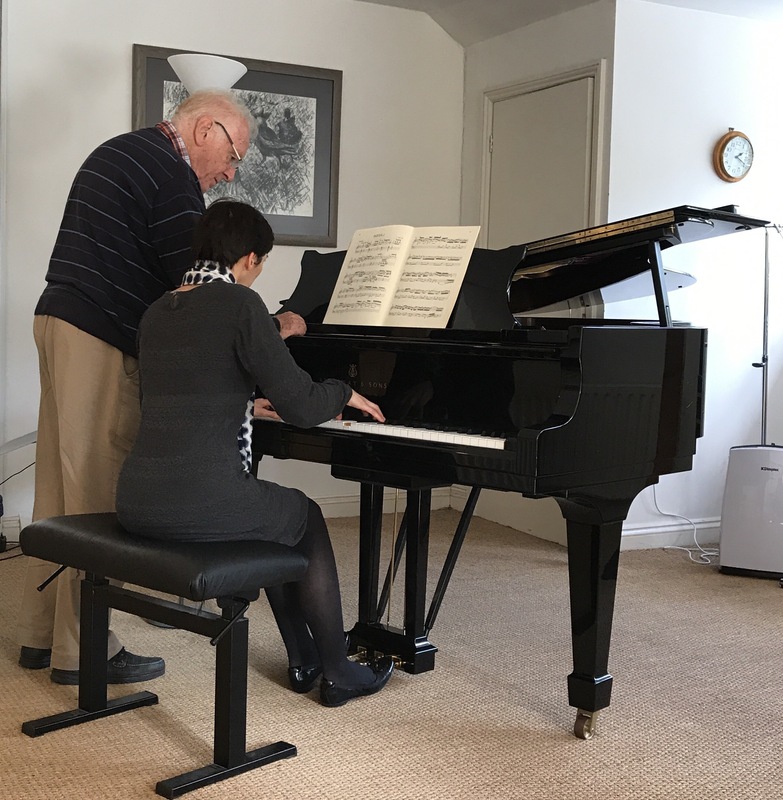 Tutors on the popular piano courses include Graham Fitch, Margaret Fingerhut, Julian Jacobson, Philip Fowke, Mark Polishook, Mark Tanner, Penelope Roskell and Stephen Savage. The ethos of Jackdaws is ‘Access-Inspiration-Inclusion’ and the atmosphere and teaching is relaxed, convivial and supportive. Course participants and tutors eat together at a large round table downstairs, meals are freshly made, generous and wholesome, and there are frequent breaks in the teaching schedule, plus free time to practise, socialise or explore the surrounding area. Participants stay with local bed and breakfast hosts in Great Elm or nearby villages. I have been meaning to visit Jackdaws for several years: I’d heard so many positive reports of the courses and the place from pianist friends, and a short course with a small number of participants appealed to me. (I have not been tempted by larger piano courses such as the summer schools for pianists at Walsall or Chethams, nor the very expensive summer piano courses in France). It was serendipitous when my regular piano teacher Graham Fitch suggested I go on course called Finding You Voice At the Piano with Stephen Savage. Graham studied with Stephen at the Royal College of Music, and from the outset I found Stephen’s sympathetic and encouraging approach familiar from Graham’s teaching style. Teaching is organised in a masterclass format which allows all participants to learn by observing one another being taught. We were fortunate in that there were only 4 people on this course which gave each of us the luxury of longer sessions with Stephen and the chance to further explore ideas which emerged from the teaching sessions. And from a piano teacher’s point of view, observing an expert tutor in action is also very instructive. Our enjoyable mealtime conversations included repertoire, concerts, favourite recordings and artists and piano teaching anecdotes. These convivial interludes in each teaching day helped to forge a sense of shared purpose and musical friendship, which I think really aids learning because one quickly feels more at ease playing in front of others if you’ve shared the same dinner table with these people. The teaching was of the highest quality: Stephen is expert at very quickly seeing what each person needs to bring their repertoire to life (in my case, a greater richness of sound and drama in the final movement of Schumann’s Fantasy in C, and more continuous energy in the opening movement of Schubert D959), and gave each of us useful advice and suggestions for practising, including strategies to bring security to leaps, chord progressions or rapid passagework. It is always wonderful to see how individuals develop, how their music changes, under the tutelage of a teacher like Stephen Savage, and it gives one inspiration and encouragement to keep going on one’s personal musical journey. In addition, courses such as these are a fantastic opportunity to hear, share and discover repertoire, and a chance to make new piano friends. In terms of facilities, Jackdaws has a good Steinway grand in the main studios upstairs, a further Bechstein grand downstairs plus several upright pianos, a digital piano, a harpsichord and a spinet. Practice time is booked In half-hour slots using a simple rota and everyone was very good-natured about organising this. There is also free WiFi. In sum, this was an inspiring, stimulating, enjoyable and highly instructive weekend piano “retreat” which I recommend to any adult pianist but particularly those who have not attended a piano course before or might be unsure about signing up for a longer course.